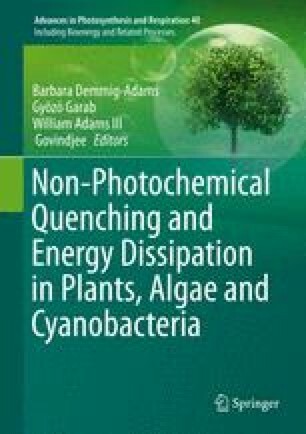 Research into non-photochemical quenching of chlorophyll fluorescence (NPQ), as an indicator of the thermal dissipation of excess excitation energy, has involved a number of different of approaches, drawing technology and intellect from a wide range of disciplines, from physics and chemistry through to ecology and agronomy. The timing of these approaches owed much to developments and advances occurring in these disparate areas of science, but also depended on the gradual evolution of our thinking about what NPQ was, what function it reflects, how its measurement could be exploited and ultimately what its molecular mechanism could be. The foundations of our current knowledge were laid 40 years ago, following intensive investigation of the bioenergetics of the thylakoid membrane, and the seminal papers on which this was based are described here. As our understanding of the biochemistry and biophysics of the thylakoid membrane increased, new ideas about NPQ emerged. The light-harvesting complexes of photosystem II and the xanthophyll cycle carotenoids bound to them have been the central features of NPQ research during the last 20 years. Outstanding advances in molecular genetics, in structural biology, in time-resolved spectroscopy and in the extraction and purification of membrane proteins all had major influence. The development of two main NPQ theories was the hallmark of this period. First, the idea that the process underlying NPQ was intrinsic to the main LHCII trimers, that these complexes can switch between unquenched to quenched states, that the equilibrium between these states is dependent on protonation and de-epoxidation of the xanthophyll cycle carotenoids and that the process is ultimately governed by the dynamic macrostructure of the grana membranes. Second, the notion of zeaxanthin as the specific obligatory quencher, bound to internal sites in the monomeric minor complexes (the gateways between the “bulk” LHCII antenna and the PS II cores), the activation of which is triggered by protonation of the PsbS protein. The emergence of these ideas is described, critical experiments highlighted and prospects for future progress assessed. The article concludes with a note on the ecological and agricultural implications of NPQ. Antheraxanthin, violaxanthin and zeaxanthin, collectively the xanthophyll cycle carotenoids. I wish to thank all those who have been my collaborators and/or my competitors over the last 30 years of researching into NPQ. I am indebted to all the excellent students and postdocs who have worked in my group and contributed to the story depicted in this chapter, in particular Alexander Ruban whose contribution to the development and exploration of the LHCII aggregation model was pivotal. Finally, I acknowledge the inspirational work of Jean Marie Briantais and Heinrich Krause that was the starting point for my quest.